Our post is focusing veterans’ support to things that welcome home today’s combat veterans. These men and women are building families and returning to work or to school. We are now adding facilities and services to make our post more family-oriented. One local scout, Harrison Czajkowski has just completed a project in support of this effort. 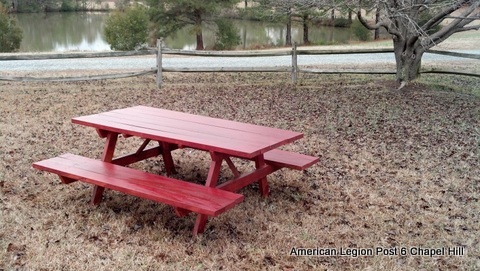 His project was to build and erect picnic tables. Families need a place to gather under the shelter of our trees. So, this project is an important contribution to our efforts to change the focus of the local American Legion Post. Our post site is over 35 acres and includes a nature habitat, a large pond, and park-like areas and offers many opportunities for community service activities. The picnic tables are a first step in our move towards making this a reality. Out-patient Veterans from the Durham VA Medical Center use our pond for rehabilitation recreational fishing. The tables give them a place to relax, chat, eat, and support this special project. Local scouts, especially Troop 505, use our common use and pond shoreline for outside meetings and recreation. The tables give them three new recreation and meeting zones. Area Scouts and Cub Scouts use the post for special events and Jamborees. The tables provide support to these activities. The Chapel Hill community joins the post members for commemorative events and band concerts. The tables provide accommodations for families. The Post rents its facilities to local groups and families. The tables enhance our facility, make it more desirable, and provide better support to our guests. We thank Scout Harrison Czajkowski for his Eagle Scout Project. It is a valuable new addition to our Post. What a great idea for an Eagle Scout project! Way to go Harrison! Maybe we will be sitting at those tables some time soon!